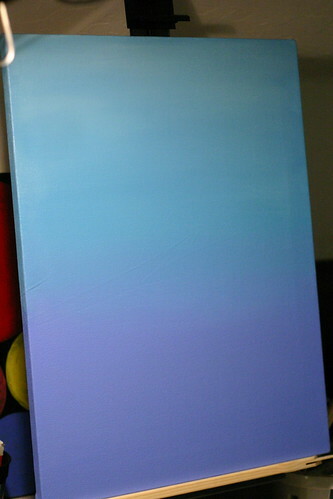 I’ve decided to be brave and started my new painting. It’s the one of the beautiful tree with a hidden surprise. My art instructor suggested I use ultramarine blue at the top and cerulean blue at the bottom for the sky — both mixed with white, of course. Yes. The canvas is upside down. I started painting the sky in class. I mixed together one of the blues with a generous helping of white, then added a dab of Acrylic Glazing Liquid to increase the open time (in other words, make the paint dry slower, so I could blend). But it just wasn’t working. So, I brought the canvas home and tried again. I added a bit more AGL and some water. This just made a mess. Then I decided to read the bottle. I’m sure you can tell where I’m headed. Apparently, if you’re wanting to increase the blendability of your acrylics, you need to use a 1:1 ratio of AGL to paint. Oooooo! Guess it helps if I use enough, huh?